The poster will argue that a retrospective museum-like exhibition of digital media leads to further developments in the field of ‘visualisation’: the study of the past offers new opportunities to emerging technologies. The poster is based on an exhibition entitled ‘Is the virtual real?’ which took place at the University of Paris-Sorbonne in October 2009, organized by the Research Centre CATI (Cultures Anglophones et Technologies de l’ Information http://www.cati.paris-sorbonne.fr), and on the work in progress of the digital preservation of the exhibition. It will be supported by computer demonstrations showing 1) the time-perspective issues in a retrospect on the history of Virtual Reality: examples of the variety of the original documents 2) the interaction between different areas of expertise in IT related to visualisation, and between history and IT practice, during the exhibition 3) the preservation of the exhibition on digital records as a source of new projects. A retrospect in a museum of science will have to show that present-day IT applications are a convergence of many technologies of the past, eventually leading to simulation. The first micro of the 1970s, the Micral N (1973) was made for a laboratory in agronomy studying evaporation phenomena. Still earlier, an analogue machine dating back to the 1960s, the EAI 580 (1963), before the digital age, was used to calculate possible options and variations for industrial processes such as crane counterweights and plane landing without visibility; it was later used in research laboratories. The idea of ‘simulation’ existed long before it converged with digital technology, which in early days lacked the necessary computing power, and took over only when its computing speed made it appropriate for simulation. Image or simulation technologies were first distinct from computing, and a retrospect has to show the separate strands. The present computing power gives a new approach to history, by allowing us to ‘experiment’ with the past. A hypothesis on the construction of the Egyptian pyramid can be tested with a CAD programme by an architect – a version of a present-day approach to industrial history where the expertise of professionals is required to assess the plausibility of hypotheses concerning industrial processes of the past. VR programmes meant to reconstruct the architecture of past centuries – Italian Renaissance buildings or the Georgian city of Bath – use the same CAD tools as those employed nowadays in architects’ practices to plan for future buildings. A case in point is the Renaissance theatre which was published as a woodcut in a 16th century book, then, thanks to present-day architectural software, became a 3D virtual model, which in turn served as a plan to build a real wooden model; passing from 2D to 3D enables the viewer to visualize the gradual distortion of the stage set as the spectators sit farther from the seat of honour. The experimental approach also concerns the public, who can navigate interactively. Examples of games exemplify the exchange between entertainment and professional simulation, such as flight simulators which may be used for both; and game engines may be used for architectural or historical simulations. Technical practice gives a better understanding of an art. The visitors in the exhibition could experiment the creation of 3D graphics themselves on a computer at their disposal: practice on present-day software enables the visitors to visualize the interaction between geometry, technology and aesthetics that have made the history of VR – and of architecture. They experience a new view of art history, starting from cylinders and half-spheres to produce an image of Classical rotundas with circular colonnades and domes. 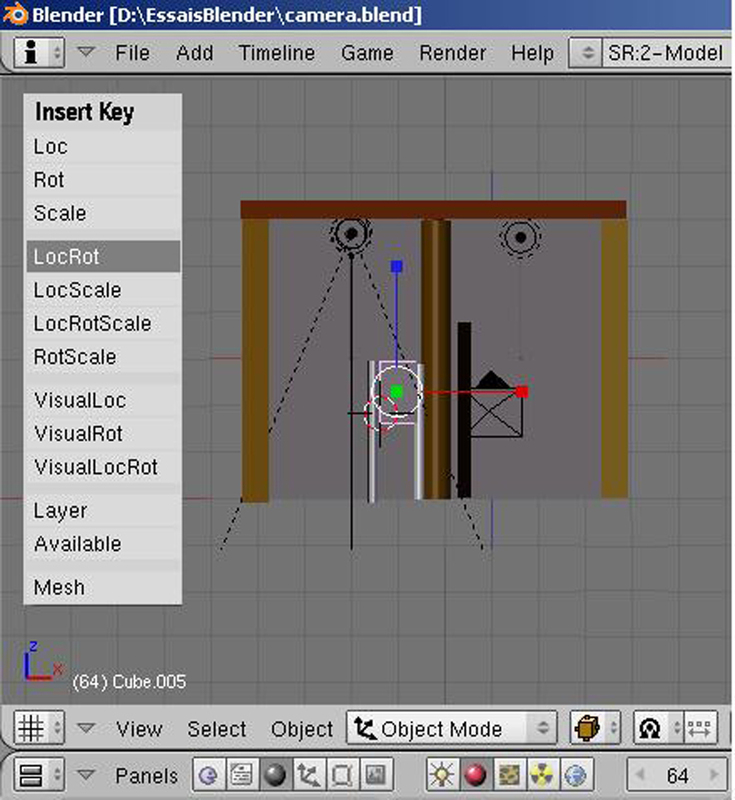 Various modes of presentation contextualize this combination of VR programmes running on machines, both professional finished projects and visitors’ experiments: they need to be supported by explanatory panels on the history and practice of CAD and VR, placing it in a historical context – 3D modelling dating back to Renaissance perspective. The panels also have to explain the main notions of 3D graphics: the creation of primitive forms associating geometry and art, the use of textures, lighting and perspective through the ‘camera eye’, and eventually animation. They show how the basic techniques of geometrical coordinates experimented by the visitors underlie, after much elaboration, the artistic finished products of VR that they can admire in the exhibition. Virtual worlds such as Second Life, where the computing power and network capabilities required can be used for artistic purposes such as a live jazz performance broadcast internationally, also exemplify the interactive possibilities of VR. Films on the history of VR are shown, and here again media technology has to be harnessed so as to suggest the historical perspective, based on the practices of digital visualisation aesthetics; this involves cooperation between historians of IT and digital media technicians. Documentaries dating back to the early 1990 differ in pixel definition from cutting-edge trailers of new programmes, yet they have to appear on the same screen; videos on VR in medicine and videos on architecture are focused differently. The resulting films have to show both the similarity in techniques and the differences in purpose between documentaries in these various areas. A solution is to present the early films in a smaller format which makes pixelisation less visible, and surround them with a frame to recover the format of the larger films; the frame effect will in addition give them an old-fashioned air which will suggest the time perspective. The layout of the exhibition is meant to relate the various IT programmes presented. 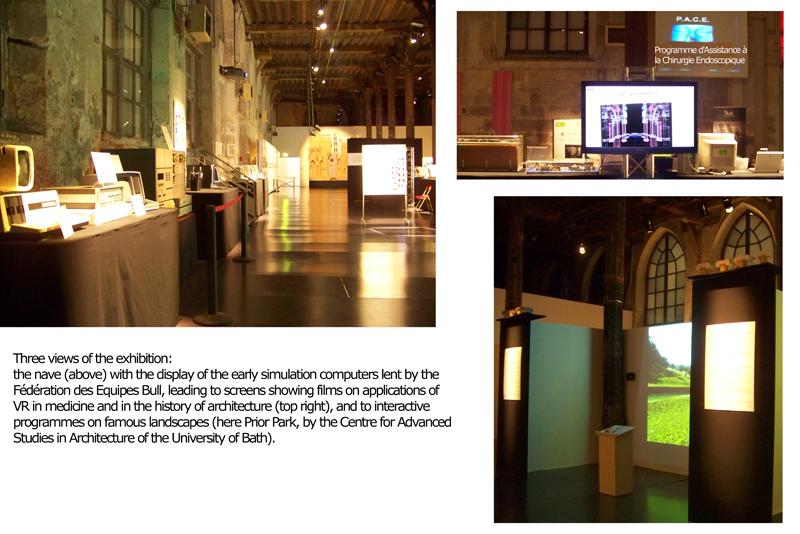 An option was to take advantage of the exhibition space – in our case, a linear two-nave 15th century building, in which a circuit was organized so as to trace the history of VR from its beginning to present-day supercomputers. The lighting is also of great importance, implying cooperation between the electricians specialised in museology and the historians of IT who are responsible for the exhibits, who need to learn to understand one another’s requirements so that the exhibition space is equipped and lit in order to throw into relief working machinery (not static objects as in other exhibitions). An exhibition on simulation takes advantage of IT technologies, and in return it gives new options for developing these technologies. Records of the exhibition will be preserved as ‘augmented reality’, a project which will maintain a permanent record of the exhibition. The architectural setting of the exhibition is suited to VR, so that the result will be the history of VR within a VR model. A narrative structure will have to be combined with a virtual spatial environment. The project is thus a contribution to theories on the structure of digital information. While the exhibition was on, records were made: photos, films of the lectures, which will be integrated with the documents shown, originally in several formats. The recording of the exhibition in progress for future VR use was part of the sessions themselves. Visualisation thus combines aesthetic and technical issues at several levels. The poster with give images for each point; the several types of computer programmes presented with it will allow the conference delegates to experiment on demos of work in progress as well as see views of the exhibits at different scales.